This isn’t just a travel bag. It’s travel insurance. You’ll never have to leave anything important behind again with our sturdy, extra-large capacity travel/toiletry bag. 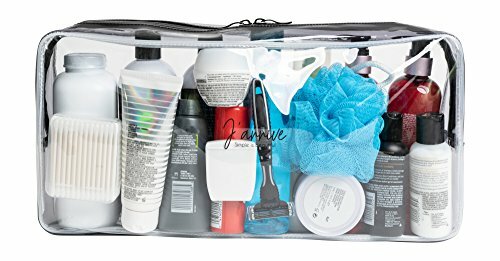 It’s 25% bigger than other “large” capacity bags, with storage space to hold everything you need: full-size shampoo bottles, soaps, lotions, medicine bottles, sponges, brushes… even hair dryers and electric shavers! And you’ll never have to worry about spills, leaks or other surprises with our waterproof, leakproof design. FIT EVERYTHING IN OUR EXTRA-LARGE BAG. Our premium toiletry bag is designed to hold all your personal essentials in one place: full-size shampoo bottles, beauty products, medicines, shaving cream, electric (and non-electric) razors, hair dryers, makeup, dental care, body lotion, baby care products and more. Measurements – length: 16.5 inches (41.5 cm), height: 8.0 inches (20.5 cm), width: 3.5 inches (8.9 cm). SEE-THROUGH FROM EVERY SIDE. You can always find what you need in seconds. With our high-quality transparent plastic exterior, there’s no rummaging through dark bags to look for lipstick or nail clippers. SIMPLIFY AND STAY ORGANIZED. This unique bag is specially commissioned by J’arrive for the uber-packer. Never underpack again with this versatile and extremely spacious bag. Stores easily in your luggage. DURABLE, HIGH-QUALITY CONSTRUCTION. Extra-thick plastic (0.5 mm thickness) is easy to clean, waterproof and designed to resist punctures and lock in leaks or spills. Strong, double-stitched zipper and quality metal zipper pulls are built for repeated use, while the multi-piece design provides extra reinforcement for heavy items. MULTI-FUNCTIONAL, VERSATILE DESIGN. Our toiletry/travel bag is perfect for men’s and women’s toiletries and all your travel needs where space, durability, protection and transparency are important: childrens’ toys, pet supplies, art supplies, extra clothing, rain/swim gear and more. This entry was posted in Shaving Creams, Lotions & Soaps and tagged Bag/For, Bag/Transparent, Clear, ExtraLarge, LeakProof, Toiletry, Travel, Women.